22% of the world’s total population uses Facebook. Whatever niche you’re in, there are potential customers waiting for you at the click of a button. While Facebook advertising can be immensely lucrative, there is a significant learning curve before you can expect positive results. Recently, PPC advertising has become more competitive. 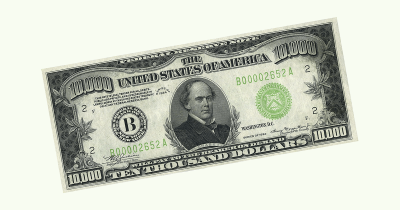 As advertisers flock to Facebook, this drives up the cost per click for campaigns and makes it harder to turn a profit. Some marketers pour money into Facebook only to leave empty-handed, concluding that the platform simply doesn’t work. In the early phases, losing money is inevitable (believe me, I know). However, I recommend you treat this process as an investment in your education. Sure, your first few campaigns might tank – but you’ll learn invaluable insights about what your audience responds to, which will help you to iterate and improve. In order for you to move from losing money to running profitable campaigns as fast as possible, consider implementing the following hacks. Targeting people based on their interests is a good start, but you also need to ensure you’re targeting buyers rather than curious web surfers. In any niche there are casual fans and diehard fanatics. Which group do you think would be more likely to purchase when they see your ad? If I were selling mixed martial arts apparel, I would want to put my message in front of people who have UFC posters all over their walls, MMA-themed bed sheets and signed t-shirts from their favorite fighters. Targeting the fans of Conor McGregor, the world’s most famous fighter, would be a mistake. Sure, he has more fans than anyone else, but only a minority of his fans are diehard MMA fanatics. People tune in to watch Conor McGregor fight when they haven’t watched another UFC event for the entire year. Instead, it’s better to target niche celebrities who the casual fan won’t have heard of, but who the diehard fans love. Input an interest, then view the ‘Page Likes’ tab to view the affinity scores. 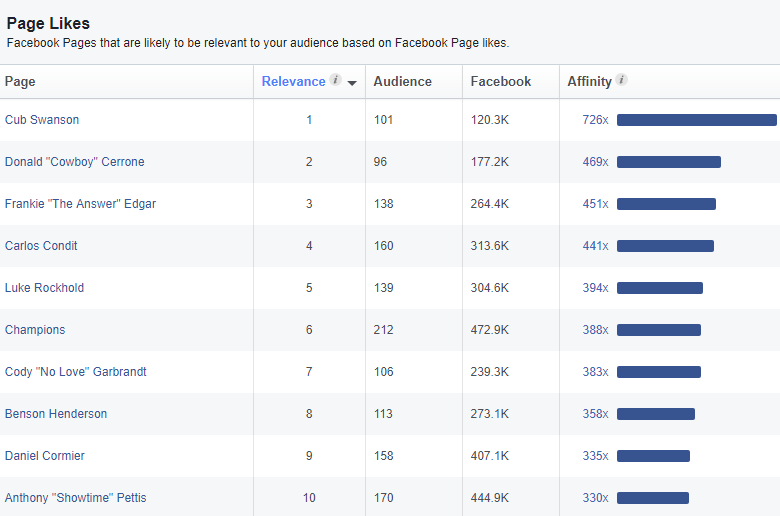 This shows you the likelihood that fans of your interest (compared to the average Facebook user) will like other pages. If all the other pages pertain to your niche and you’re seeing high-affinity scores throughout (100x and up is superb), you’re onto a winner. Jorge Masvidal is a UFC fighter, but unlike Conor McGregor, his followers are predominantly diehard mixed martial arts fans. This is confirmed by the affinity scores for his page, which show that his average follower has an extreme likelihood of following other fighters – and is, therefore, a fanatic rather than a casual fan. 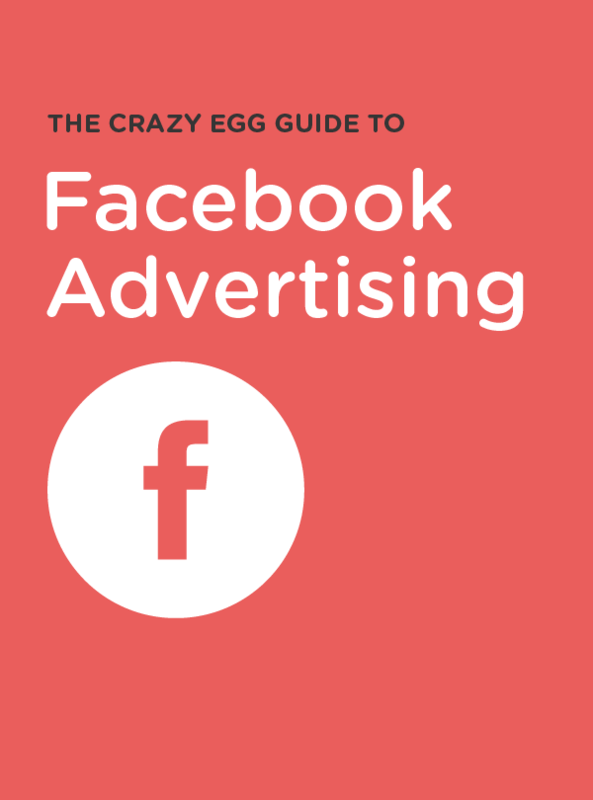 When you run ad campaigns, you’ll also grow your Facebook followers. Every time someone likes one of your posts, you can invite them to follow your page – which a significant portion will accept. Often, you’ll find that campaigns targeted towards your Facebook fans will convert better than campaigns that target cold traffic using interests and demographic data. However, you can take things a step further by targeting the fans who have been engaging with your content. Amanda Bond, the founder of The Ad Strategist, has a few handy tips to help you reach your most passionate followers. In ads manager, click the ‘Audiences’ tab and then select ‘Create a Custom Audience.’ Next, create an audience of people who have engaged with your page (not just liked) over the past 365 days. Try running an ad campaign to this audience and test your results. You can find Amanda’s guide for setting this up here. If you post video content on your Facebook page, consider creating a custom audience for people who have viewed a percentage of your videos. If someone has viewed 25% of a video, that means they’re familiar with your brand and will be more receptive to your ad campaigns. Amanda’s guide for this process can be found here. When you start advertising with Facebook, your decisions will be made based on assumptions. If your audience is on the younger side, perhaps you’ve concluded that they use smartphones more than desktops – so you choose to run ads primarily to mobile devices. Maybe you’ve created a product with men in mind and completely neglect female buyers in your targeting. In my opinion, it’s far more effective if you keep your initial assumptions loose, then innovate based on the wealth of data Facebook has available for you after you run your first campaign. In ads manager, click the ‘Performance’ tab and then filter your results by ‘Performance and Clicks’. Next, in the ‘Breakdown’ tab, you have a number of filters available. 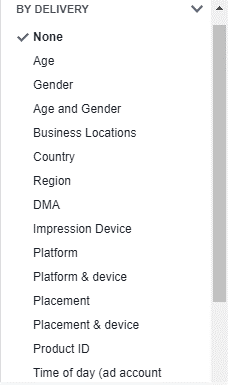 ‘Age,’ ‘Gender,’ ‘Platform’ and ‘Placement’ are some of the most important filters – but feel free to use others if they look relevant to your campaign. When you can see the breakdown of your audience in terms of cost per click, click-through rate and most importantly, cost per acquisition – you can then make inferences about what types of people are responsive. If you believe that mobile users are more likely to convert than desktop users, see if this is reflected in the data. If you see a trend after running a campaign to both devices, run a $5 per day split test (one ad to mobile and another identical ad to desktop) to see if you’re correct. If your metrics look better for people 35 and over, run your next ad for this age range and exclude younger users. Always put your assumptions to the test and ultimately, let the data guide your decision making. Ad fatigue refers to the phenomenon of people being unable to process your ad psychologically after viewing it multiple times. In the earlier days of internet marketing, this was referred to as banner blindness. Particularly if you’re targeting a smaller audience, you won’t have to wait long before your ad is shown to the same person numerous times. You can monitor this in the ‘Frequency’ tab in ads manager. The more times a person sees an ad and takes no action, the less likely they are to convert. Yet, Facebook is still charging you every time the ad appears in the person’s newsfeed. This is verified in a study by Adspresso, which shows that when the ad frequency reaches 9, the average cost per click increases by 161% compared to the beginning of the campaign. To combat this, I recommend refreshing your ad creative when your frequency is moving upwards and your KPIs are declining. A new headline or image can help to get your campaign back on track. Not sure where to find good ad images? Take a look through a free stock library then add some text using Canva. Alternatively, you can incorporate multiple ads (creatives) into your ad set from the beginning and rotate them. The more ads you have in your ad sets, the longer you will have to wait before your frequency starts creeping up. If you’re still not able to turn a profit after relentlessly testing you interests and tweaking your targeting for months – you might want to try an alternative approach. Instead of using Facebook ads to bring people into the top of your funnel, consider using other channels to make contact initially and then use Facebook ads to push for a conversion. In my experience, Instagram influencer marketing provides an excellent ROI. Neil Patel came to a similar conclusion when paying Instagram models to promote his brand in 2014. With tools such as Ifluenz, you can search a large database of Instagram influencers and pay someone in your niche to do a shoutout for your brand. 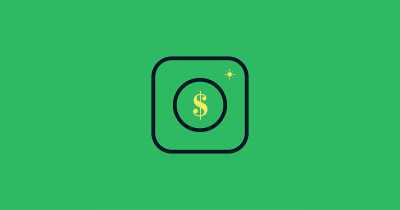 Most Instagram influencers are not slick marketers, which makes them grateful for opportunities to monetize their accounts. Especially if you target up-and-coming influencers, the cost to get them to promote your product on their page is low, but the return can be fantastic. If you pay for them to host a permanent ad image on their page, you will continue to acquire traffic as their channel grows. When the influencer promotes your product, they will link to your Instagram account in the post. When their followers click through to your page, include a link to the product or landing page in your Instagram bio. So, what does this have to do with Facebook ads? 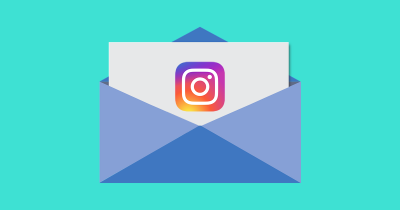 Considering the average landing page conversion rate is 2.35%, you’re still losing out on 97.65% of the visitors who came from Instagram and left without purchasing or giving you their contact details. That’s okay, you can win them back on the next encounter with your brand via Facebook. After all, retargeted customers are 70% more likely to purchase compared to cold traffic. After installing Facebook Pixel, you’ll be able to track the movements of your visitors on your site. In the ‘Audiences’ tab, click ‘Create a Custom Audience’ and generate a new audience of people who have visited the URL of your product or landing page but who haven’t visited your thank you page (so they didn’t convert). Next, fire off a retargeting ad reminding them of the product they viewed but didn’t purchase. You may want to include a discount code or leverage scarcity in order to encourage the conversion. You will usually find that retargeting campaigns incur a much lower CPC and CPA compared to campaigns that target cold traffic. Can you think of any other Facebook ad hacks to improve your campaigns? Please let me know in the comments below. About the Author: Aaron Agius is an experienced search, content and social marketer. He has worked with some of the world’s largest and most recognized brands, including IBM, Coca-Cola, Target and others, to build their online presence. See more from Aaron at Louder Online, his blog, Facebook, Twitter, Google+ and LinkedIn.